Agents can be configured to be member of one or more groups. Such groups are then associated to a waiting queue to define who is an agent to the group. When you start the Waiting Queue PBXManager plugin, it will list all currently defined queues. As you have none so far, it will show an empty list and a + Add a Waiting Queue button . Congratulation, you have created your first waiting queue! ). However, nobody will ever take the call. We first need to define who the agents for queue will be. in the list of defined queues. Generally, users can be structured into groups and this mechanism is used to define the agents who will serve a group. In other words, a group is created and users are added to it. Then, the group is set as "the" group that define the agents for a waiting queue. The plugin will create a new group for the waiting queue when you click on the + sign underneath the Agents area. This group is called like the queue's SIP property with an index appended (hqswb-0 in our case). In the Add a group dialogue, you can select the agents to be added to the group. to our waiting queue and put yourself and Lisa Svensson into it! , you will hear it ring on Lisa's and your own phone. Unfortunately, you are busy following the training and Lisa seems to be lazy - nobody takes the call. It therefore would be nice to add another group of agents to the queue. These agents would be called if none of the first agents takes the call. The waiting queue can do that. You might have observed the primary check-mark in the queue's agent group definition. It was checked by default. This suggests that there may also be a secondary group. And indeed, you can add another group of agents to the queue which is not ticked as primary. to the queue and add Mario Rossi as an agent to it. When you now call the queue from Jean, you will see (and hear) that all the agents (yourself, Lisa and Mario) ring immediately. That was not the idea! The thing that is missing is to define the timeout for the switch-over to the secondary group. So the PBX does it at once. 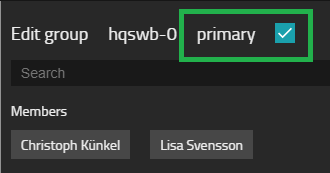 This timeout is called Primary Group Timeout and can be found in the Settings section of the queue definition and is given as the number of seconds. When no agent is or becomes available, neither from the primary nor from the secondary group, the call will alert forever (well, not exactly forever - after a quite long while, it will be disconnected). To keep calling customers happy while they wait for an agent, it is useful to play an announcement (something like We are pleased that you have called us and your enquiry is of great importance to us. Please be patient until an agent is available to speak with you in person). To the PBX, an announcement is a file that contains raw media data. When an announcement is to be played, the PBX will retrieve the media data file from a web server using HTTP(S). As calls may use different codecs (we have seen this during the IP Phone type of device configurations before) and the raw media data depends on the codec used, multiple files must be provided for a single announcement - one per codec. Each file would have the same base-name but different extensions . NB: looking at the file sizes in this screenshot, you see the compression performance of the various codecs. OPUS-WB has more or less the same quality as G722 has but only one third of the size. OPUS-NB is superior in quality compared to all other codecs except G722 and OPUS-WB but requires only little more bandwidth than the best compressing codecs (G729 and G723) while providing much better quality. As said before, an announcement is normally retrieved by the PBX as a file using HTTP(S) when needed and for this you need to configure the URL to the file (e.g. http://my.server.com/path/my-announcement.g711). will produce a constant tone (often recognized as a dial-tone). 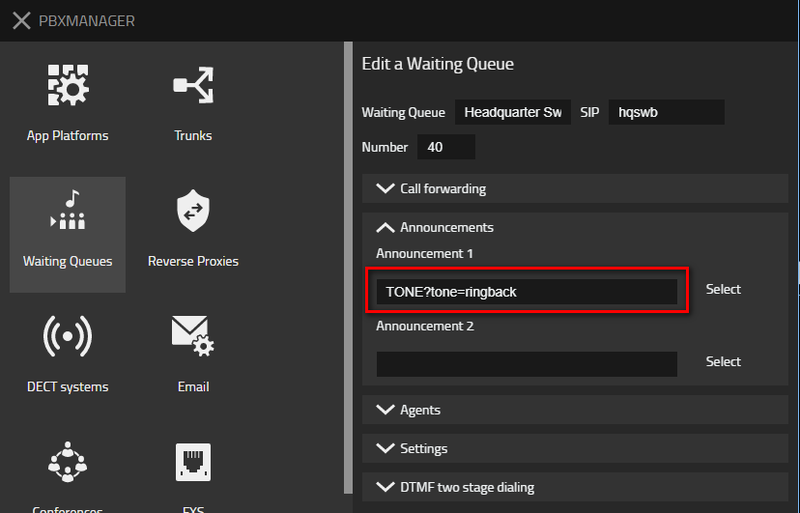 You can add a ?tone=ringback which will give you a tone sequence with 1 second tone and 4 seconds silence (this is often recognized as a ring-back tone). You can also add a ?tone=busy which will give you a busy tone sequence. Notice that the queue is only playing the busy tone, it will not disconnect the call! Popular sound file formats are .mp3 or .wav. So why does the PBX not accept these? Please download and convert them so that you have the raw media files in a single folder on your PC. As said before, the PBX will retrieve media files via HTTP(S) when needed. Therefore, to use announcements, you must store the media files on a web server. In fact, you can use any web server you might have to store media files. In many scenarios it is much more convenient to store the media files on the PBX itself. For this, the Files App is provided. It can be used to store (and retrieve) files and provides a graphical user interface for this as well as an HTTP(S) service. You're impatient and you just tried it? Then you have discovered that it somehow doesn't work yet, the announcement is not played. Note that, technically speaking, the call is answered as soon as the announcement begins to play. This for example means that the caller might need to pay for it from this moment on. for your queue to 3 seconds. When you now call the queue, you will hear an alert tone for 3 seconds and then the announcement. When you fully listen to our beautiful announcement, you will notice that the behaviour is not perfect yet. Once the announcement is over, the call will be terminated. While this may seem surprising, it is by design: when there is only one announcement assigned to the queue, any incoming call is terminated once the announcement was played. This is good for You are calling out of office hours. We'll be happy to serve you monday to friday from to 12 am to noon. Thank you for calling type of applications. However, for our queue it is less than optimal. The solution is to assign a second announcement to the queue. When there is a second announcement, the queue will repeat it forever. Now callers can wait for an agent to be available even if this takes really long. Note that in this case, the incoming call will not be terminated before it is answered, not even if it lingers around for a very long time. This is again due to the fact that - technically speaking - the call is connected as soon as the announcement begins to play. That stops the PSTNs time-to-connect timeout. Two stage dialling is when you dial into a waiting queue, hear a voice prompt and then can dial again to reach your final destination. 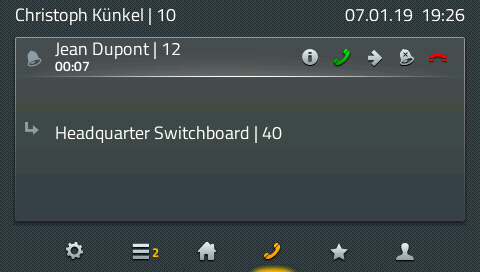 Dialling when you are already connected (to the voice prompt in this case) is done with DTMF tones. The two stage dialling settings are therefore sometimes referred to as DTMF maps. This is the typical Please dial 1 for sales, 2 for support and 9 to leave a voice message type of application. In the spoken text of the second announcement we have configured in our queue, we say ... please press 1 for Lisa Svensson, 2 for Jean Dupont and 3 for Mario Rossi. Now, Jean can call Lisa specifically by pressing 1 when prompted. Let us think what else you could do with DTMF maps. Many installations do not have a DDI trunk, or the number range of the DDI is not large enough to call all extensions (for example, you have a DDI range from +49 7031 73009 0 to +49 7031 73009 9 but you have 100 extensions). In these cases, you can specify a DTMF map that allows you to dial many extensions. This can be done by specifying a map with an empty right side. Sounds confusing? The way DTMF maps work is "when the pattern on the left is dialled, a call transfer to the number on the right side is started". However, the number on the right side is only used as the start of the number. The caller may dial the remaining digits. When the right side is 1 for example, the caller can dial numbers that start with 1. When the right side is empty, the caller can even dial all numbers. But watch out! You probably do not want to give callers access to all numbers. Most prominently, callers should not be able to call out again. So you must make sure that you do not give access to your trunk prefix (usually 0)! will first catch the bad case (*0) and route it back to the queue and then allow any other digits to be dialled after the star (*). With this configuration, you provide access to all extensions except for the trunk. which provides access to extensions starting with 1 only. you again provide access to all extensions except for the trunk. Now remove all previous settings and then carefully configure access to all of your extensions except the trunk by dialling a pound sign (#, nerds tend to call it hash nowadays). Remember to confirm each map and click on OK to save your maps. When Jean then calls the queue, he should be able to dial directly to Lisa by typing #11. #0 should re-connect to the queue however. Waiting Queue behaviour can be further configured in various way to implement different customer requirements. A load factor can be defined in the Max Calls/agent(%) property. This defines the number of concurrent calls a queue can take (including the calls currently handled by the primary operators) in relation to the number of primary operators. A value between 100% and 150% is a good starter. This calculation is made each time a call comes in. Let us assume there are 2 primary operators and we set this property to 150. The queue would then allow up to 150% of 2 => 3 concurrent calls. In other words, when all primary operators (Lisa and yourself in this case) are busy talking, a third caller will wait hearing the announcement. The fourth caller however will get a busy. Max Calls/agent is therefore usually set to a value greater than 100. If the Round Robin Timeout(s) property is configured, an incoming call is not sent to all members of the primary group. Instead it is sent to one of the agents only. When the round robin timeout has expired, the call is sent to all members of the primary group. The operator who receives the call first is selected in a round-robin manner. There are scenarios in which waiting queue agents need to change their agent-role dynamically. That is, sometimes they are available to serve the queue, sometimes they are not. There are several ways to implement such a behaviour. Generally, when an agents becomes available again, any waiting call is offered to this agent right away. A similar assumption is that agents are busy doing other things when they have a presence information set. If the Presence disables operator property is set in the queue settings, any user that has a presence set is considered unavailable and will not be treated as an agent. For this, the presence state must be set other than Available, setting a note only will not do. As you are configured as a primary agent, a call to the queue will ring your own phone (IP232). You will notice that you are not notified on your IP232 any more. A similar assumption is that agents are busy doing other things when they have a call forwarding set. If the CFU disables operator property is set in the queue settings, any user that has an unconditional call forwarding set is considered unavailable and will not be treated as an agent. For this, the Always call forwarding must be set and active, Busy or No response will not do. You will notice that you are not notified on your IP232 any more. Also, Mario is notified only after 5 seconds (the queue's primary timeout). This proves that no call to your phone was diverted to him. When you're done, do not forget to disable (or remove) the call forward. Finally, agents can change (enter/leave) their group membership at will. When users leave the group temporarily, the queue will not treat them as agents until they re-join. This behaviour does not have to be enabled in the queue settings. You will notice that you're not called. The administrator can also change the group membership status of any agent. This is done using the Groups PbxManager plugin . An administrator would change a queue agent's group membership to S if the agent is not allowed to log-off from the queue. 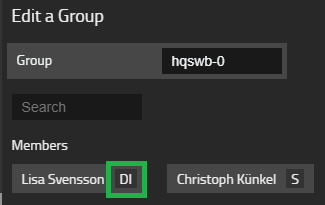 As a result, such memberships are not displayed in the user's Groups settings in the profile. In addition to the DI/DO/S state, you may notice another toggle with A and - as possible values. This toggles between an active (A) and inactive (-) membership. We'll see what that is used for in another book. For now it is good enough to remember that such modes exist and that they can be modified in the Groups PbxManager plugin. Sometimes, calls to a waiting queue can not be taken. This may happen if no agents are available (either busy talking or left their group) or if calls are made out of service times. 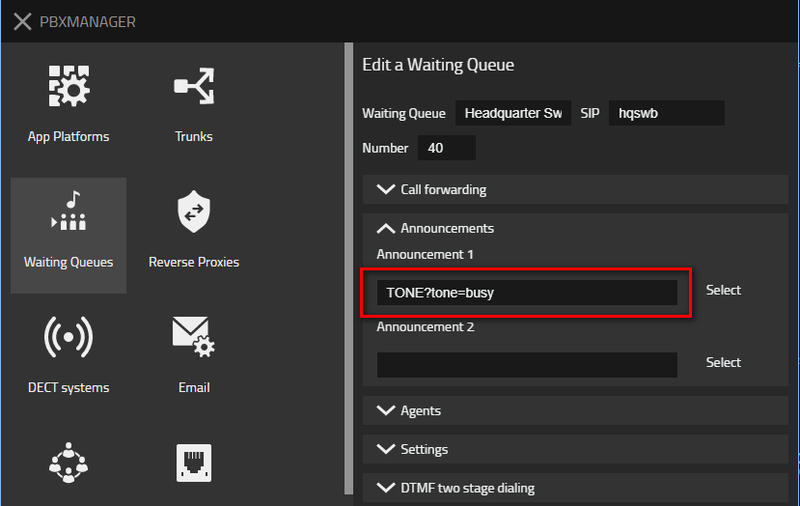 , the forwarding for a queue is managed in the Call forwarding section of the Waiting Queue PbxManager plugin. When a call lingers in a queue for too long, listening to the announcement over and over again the caller may get annoyed. It therefore usually makes sense to switch to a different queue behaviour. You could for example ask the customer to call again at a later time. The too long to complete the call condition is generally caught by a On no response call forward. By the way, On no response type forwards are often referred to as CFNR (call forward on no response). Likewise, On busy is known as CFB (call forward on busy) and Always as CFU (call forward unconditionally). The same mechanism is available for queues. To set a CFNR you use the Call forwarding section in the Waiting Queues PbxManager plugin and add a On no response forward. The waiting queue itself can not handle a third announcement. However, if you create a new queue that has your final announcement set as Announcement 1, you can forward the call to this new queue using a CFNR set on the original queue. If you now call the original queue (40) and wait 18 seconds, you will hear your new announcement. After it has been played, your call will be disconnected. You have seen that call forwards can be set towards names above (you have set it towards hqswb-to). Of course, you can also set it towards a number. You would type the target number in to the same field. If the forwarding target consists of digits only, it is recognized as a number. Of course, letting callers wait for a long time only to tell them afterwards that they should call again is sort of unfriendly. It would be nicer to know in advance if the caller has a chance to get to an agent in time. To an extent, this can be done using a different type of call forward on the queue. on the queue. When the overload situation occurs and a new call comes in, the On busy forward will be executed. You can set both types of forward on the same queue to handle both situations. A little more difficult to handle is the situation where the queue is called out of business hours. You would probably want to play a quite similar announcement as in the case before. In addition to that however, you need to define what your business hours are. This is done using a Time switch. You can make a call forward depend on such a time switch. If you do so, it is only executed during the time frames defined by the switch. Fortunately, the Install has already created a time switch called Business hours for you, so we can use it right away (it defines business hours to be Monday through Friday from 9:00 to 18:00 hours). For this desired handling of out-of-business-hours calls, we would simply set a call forward of type Always on the queue. Of course, we need to make it depend on the Business hours time switch. As we would like to use a slightly different announcement (announcement-oobh-call-again.mp3), we need an extra queue to be able to play this announcement (as before with hqswb-to). which depends on the Business hours time switch on the original queue (hqswb, not hqswb-oobh!). Make sure that the CFU is executed only when we are not in business hours! When you call the queue (40) now, you will probably hear the normal behaviour. This is because you probably call during business hours indeed. To be able to test the function we first need to look at ways to manipulate the time switch. We'll do this in the next chapter. select a number of weekdays where the time switch shall be considered "on"
Also, you can add multiple such time definitions for a single time switch (the switch then is considered "on" when any of the definitions matches). (manual on or off). In this case, the switch behaves as if it was in the respective state, regardless of the current date and time. This is used for example, if you want to overrule the time spans defined in the time switch due to an exceptional event. For example, you could switch the Business hours time switch to manual off for a bank holiday. The PbxManager plugins of course are normally available to administrators only. However, for each defined time switch, there is an app available that is called like the time switch itself. This allows you to modify a single time switch only and you can make it available to individual users, e.g. a switchboard operator. Do you remember the trunks lesson you did earlier? When we were adding a trunk to our system we had the option to configure the loopback property, which we used to reroute calls to Mario Rossi. Let's go back to that because the loopback property fulfills an important role. When a user calls the PBX through the trunk from the PSTN and just dials the trunk prefix, you usually want to make sure this call is not routed back to the trunk because this would give an external caller the ability to use your trunk line at your expense. This means the best course of action would be to use the loopback property to route calls to a Switchboard. Let's go to the Trunks Plugin and open the trunk we created in a previous chapter which we linked to the SIP trunk and change the loopack property to 40 or hqswb. You most likely are using a MSN trunk at the moment. Revert it back to a SIP DDI trunk. You should know how it works. To test the configuration we can proceed as we did in the testing section of the trunks book and dial the complete number +49 invalid member reference '.netac' in 'netac'8invalid member reference '.nete164' in 'nete164'-0 from Jean. The loopback property should redirect the call to the Switchboard and your Agent Lisa Svensson should ring. In case your call isn't working as expected, make sure your time switch is set to off.